It makes sense that an industry that works hard to present its works as coherent, self-contained universes would (intentionally or not) strive to hide their nature as authored spaces. Those rules and models are no less authored than the sentences of a novel—they’re just reactive. Auteur theory is messy because it’s too neat: it wedges works created by multiple people into a mode of single-authorship, a Great Man (when it was developed for film, it was applied solely to men) approach to understanding a work. And because how we understand a work affects how we understand how it was made, it carries a lot of power in the production of things. It narrativizes creation, gives it a single, active protagonist. I mention this because I know it’s reductive for me to talk about Quantum Conundrum without talking about Kim Swift, and Valve’s Portal, and Portal 2. But it’s good that I can’t evaluate this in a vacuum, right? Swift was part of a student team from DigiPen that was hired by Valve a few years ago. Their project, Narbacular Drop, was massaged into Portal. About two and a half years ago, a few years after the release of Portal, Swift left valve for Airtight Games. Quantum Conundrum is the second game from Airtight. Their previous game, Dark Void, was set in a world of zeppelins and flying machines, and involved flight by jetpack. Quantum has very little to do with this. Instead, it’s structurally almost identical to Portal. You move through a giant facility segmented into a series of areas filled with environmental puzzles. These spaces have an in-game author (in Quantum, your bachelor-mad-scientist uncle) whose disembodied voice accompanies the player through the challenges. But where Portal was about changing spatial relationships by punching holes in the world, essentially bringing two points together, Quantum is about changing its physics. There’s an explanation about different dimensions, and how you’re opening rifts that cause these other dimensions to take the place of the normal one. The explanation is irrelevant, but that’s ok: it’s there to explain why you can’t shift into each of the four dimensions in every area. In the Fluffy Dimension, everything is “ten times lighter”, which in practice means that you can pick up safes and nothing is heavy enough to break glass. Stand on top of a safe in front of a fan and switch to Fluffy Dimension and you and the safe go sailing through the air. In the Heavy Dimension, everything is “ten times heavier”, which means cardboard boxes can break panes of glass (which are apparently not affected by the dimensional shift) and lasers (there are lasers) can’t destroy items. There’s a dimension where time is slowed down (allowing you to more easily jump between the fast-flying furniture that serves as the game’s platforming) and one where gravity is reversed (turning safes and couches into makeshift elevators as they fly toward the ceiling). Every room is like a Rube Goldberg machine with a few pieces missing. Your job is to figure out which bits of the machine you need to be. I’m fairly certain that, just like with Portal before it, the rules of the world allow for some unexpected solutions to puzzles. One of the things that Swift seems to have brought over from Valve, though, is an approach that guides the player toward a solution, hopefully without them realizing it. Back when I wrote about Fez, I suggested that part of the reason auteur theory seems to work so well in the puzzle platformer is because they’re spaces that go against the videogame grain and embrace their artificiality by giving you, the player, some means of environmental manipulation. You’re not just tied to moving an avatar—you can affect the world almost like a designer. And if an environment feels designed, it projects the presence of an author. Which brings us back to Portal. In that game, the disembodied voice that accompanies you, GladOS, is a proxy for the-designer-as-antagonist. 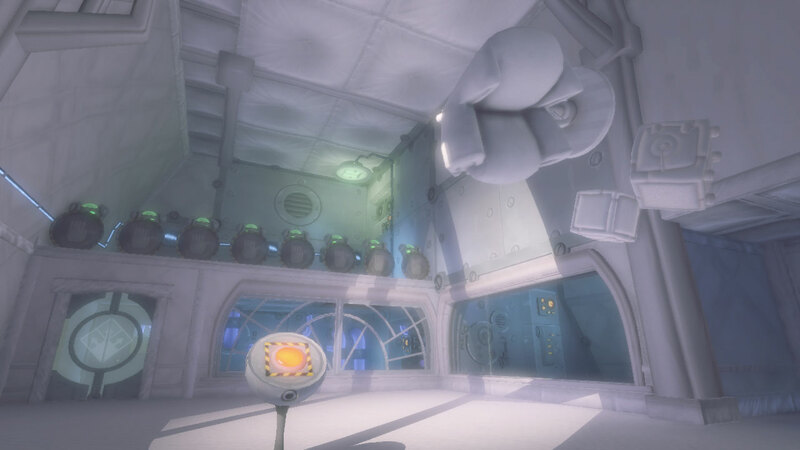 In its sequel, she’s joined by Cave Johnson (via recordings out of the past, like a ghost: audiologs with personality) and Wheatley, who takes over the facility and designs test chambers of his own. Wheatley is the modder, who remixes the space based on rules someone else has determined. Or maybe he’s the latecomer to the project, taking over from the former matriarch. Quantum’s Professor is more nuanced than these characters. He’s modified the space like Wheatley has, turning the family estate into a series of deathtraps. But his seeming disdain for the player character comes from arrogance rather than sociopathy. A somewhat more sympathetic designer-proxy, his quips are not as hostile (nor as hilarious) as his robotic predecessor. And that’s where that “Except” above comes in. Because, see, the Professor (or, rather, the code that triggers the Professor’s audio clips) gives you hints. Sometimes after only a few seconds. He becomes the friend who’s finished the game, who’s impatient with you for not being able to quickly suss out the solution. It is his (and the game’s) most irritating trait. There’s no nuance in his code; he can’t tell if you’re looking around to take in the scenery or if you really are stuck. He’s impatient. I personally enjoy figuring out the solution and would be more than happy describing how I would solve it without the hassle of actually having to do it. It’s why I find the Professor more annoying than helpful: just let me figure it out myself, buddy! If you want to be useful, you can actually do the jumping for me. That this division is possible is where Quantum takes its biggest cue from Portal: these are puzzles that are solved in two parts. First, mentally, as you look at the Rube Goldberg setup and figure out what to do. Then, manually, with timed jumps and table-rides. It’s very possible that, had Swift stayed at Valve, Portal 2 would have been more like Quantum Conundrum. More complexity in the puzzle systems, more nuance in the guide (maybe the Professor would have been a little less obvious in his hints). It’s a really interesting case, with a prominent designer of a game bringing a lot of structural elements to another game at another studio, less than a year after the original studio made its own sequel to that game. Quantum Conundrum does a lot of great remixing of its puzzle mechanics, and figuring out how the different dimensions work together is one of its greatest joys. It’s just kind of annoying that it won’t always let you figure things out on your own. Brian Taylor apologizes for talking so much about other games in this review, but he really couldn’t stop thinking about Portal and Portal 2 while he was playing.